• A unique idea; The concept of making an application unique doesn't outright refer to developing an app with a crazy idea no one has come up with. It could be a better and improved version of an existing mobile app or even an app for your website or business. By uniqueness, it means your app idea shouldn't be something of no value or a verbatim duplicate of an existing app. • The right mobile app developer; This factor is apparently the most consequential regarding the success or failure of your mobile app. The right mobile app developer can turn your average app idea into something spectacular, just as the wrong mobile app developer can wreck your brilliant and unique app idea. • A ready to use mobile app; Having crafted your mobile app idea and hired the right mobile app developer, the next thing to expect is a ready to use application. Before trying to market or release your app for use, be sure to test run all its features and try to ensure everything is in great condition. • The right marketing platform and strategy; There are many options regarding mobile apps publishing platforms, depending on your project and intended users. For example, while the Google Play store may be the ideal store for an Android application, the windows app store is certainly the wrong place to publish an Iphone app. However, you app can also be developed to be compatible with all available platforms, which will be a big advantage for a public app. • Consistency, Patience and determination; You shouldn't relent after publishing your mobile app, study the result, update if necessary and continually promote to your target audience base. There are also a few mobile app development companies who can help with both the development, marketing and maintenance. The concept of the freemium model of mobile app monetization is quite simple; it's like preparing a nice meal, allowing others to perceive the lovely aroma of the food and eventually given them a 'ridiculously' limited portion of the meal and asking anyone who is interested in more to fulfill a certain obligation. One thing is common in most mobile apps that use this model, and that's the ability to give enough to convince users that they need more. Certain features may be set to be used for a limited time or certain features may even be locked outright, among other trick employed in the freemium model. Users may be given the option of outright purchase of the exclusive features or allowed to subscribe for a defined access to the features over a defined period of time. The concept of your app, the type, the platform, the acceptability among other factors will largely determine the best freemium techniques to use. This model is by far the most popular and successful among mobile app developers. In this case, users only need to pay once to have a lifetime access and possession of the mobile application. Depending on the app owner, user may or may not be entitled to lifetime updates for free of charge. A very important and determining factor for a one-time purchase app is its launch, it must be convincing enough to rake in a lot of money during the launching period either through its uniqueness of hype. If it make commercial sense, it's only a matter of weeks for a duplicate and cheaper app to be developed. One big downside of this model is that it cannot fetch money twice from the same pocket; the app owner must continually find fresh paying customers to purchase constantly. Core value at first use and minor updates on functionality, design and UI is very important to be successful with this model. This isn't a very common model among app publishers, but it sure works, depending on a number of factors. Many publisher tend to have ethical issues with this model even if its not as bad as it seems. The idea is to have the functionalities and features of your app in grades and class; for example, your app has A,B,C and D features, users the pay to download or upgrade to A which has all the basic features, but to use the functions and features in B,C,D, another payment will be required. This model is very tricky and may raises ethical concerns, but if your idea, service or platform is unique, nobody would even remember they paid anything. Although it isn't the most profitable model, it certainly is the most commonly used recently. The great advantage this model has over others is the fact that users are not required to ever pay any money for using the app. A lot of people aren't convenient buying or paying for anything online, while some only pay if there is no existing free alternative. This model also cuts out the need for any complex financial logistics like handling payment disputes and other related issues. There are numerous advert options from advert schemes like cost-per-action, cost-per-click, cost-per-sale, among other. Users are mostly required to perform a specified interaction with the offer in the advert. The biggest downside is the fact that profit is heavily dependent on whether the users take actions on the ads or not. With the right technical know-how on positioning, designing and display of ads, free app with advert can be very profitable. 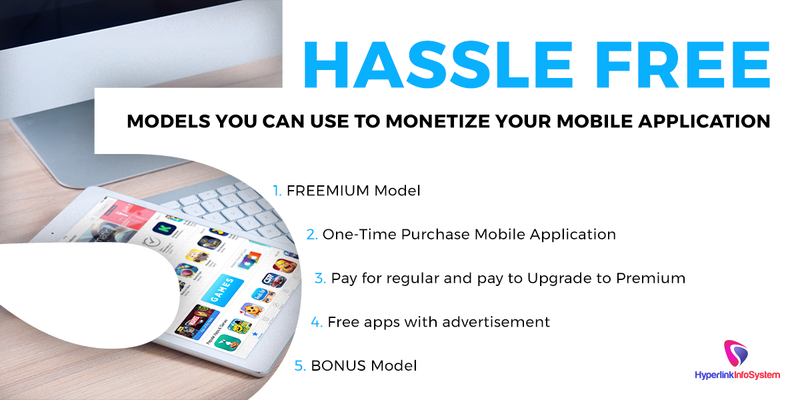 Another smart way to monetize your app is selling it to another company or individual who is willing to pay the right price to have it. Selling your app make be a bad or good decision in the long run, but in short term, you did business without incurring any loss, and that's good business. The profit can also be leveraged on to build something better or more unique. On the flip side of things, there may be no need to sell all your stake on the app, you may only sell a mutually agreed percentage of its ownership. Remember to always be unique, innovative and creative, e.g, what stops you from combining two revenue models together or even tweak any of the existing ones to something fantastic? In the end, there is no magic wand to wave when it comes to making money with a mobile app. Design the right app, get the ideal mobile app developer and employ the right strategy in branding and marketing your app then smile to the bank.